Don’t Hesitate – Just Book! You will have gathered from all the other gushing reviews that this is a fantastic place to visit. 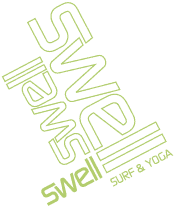 I found everything written about Swell on their website and in these rave reviews to be accurate… and more. My advice is stop reading and just book, you won’t be disappointed. At the booking stage, Clare is really quick to reply and answer any questions which was so helpful. Once you arrive there is a fantastic team in place, from Haudy’s warm welcome and organisation to the super supportive, fun surf and yoga instructors and cooks producing the most delicious, fresh and healthy food (yes, breakfast is legendary!). The place is gorgeous. It’s hard to describe the chilled out vibe but it’s my new happy place. Everywhere is super clean (and I’m fussy), from the bedrooms to the pool toilet, it’s pristine. We were up and in the van heading to the beach at 7am every morning. The first surf session works up a real hunger and breakfast is well worth the wait. Then it’s back to the beach for second session. The surf instructors were professional and fun, they really know their stuff and work hard to get you up and riding the waves asap. I felt spoilt to have such individual attention with constant tips and adjustments helping me progress quickly. Thanks Ed, Neno and Paloma for your patience and for the laughs! Afternoons are free and there’s optional evening yoga three times a week. Your body will thank you for doing this and the poolside location is magic. Martín’s classes were fantastic. He was dedicated and accommodating to all levels, my new guru! Dinner was delicious and for the nights that it’s not provided, there are loads of options. Gordito’s Fresh Mex is a must – we got take away for our pool party! Dinner on the beach was delish too – try the frozed Banana Daiquiris in Mojito Bar! The week flew by and I left Swell positively humming from the sun, sea, surf and pure fun. I’m hooked on surfing and genuinely can’t wait to go back and do it all again! Next PostNext Article James G.